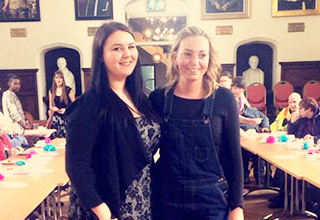 This blog is part of our series highlighting the societies and activities of UWTSD’s student union. It was written by Rebecca Bamsey, the President of the Lampeter SU, and was first published on the TSDSU blog in both English and Welsh. I believe that here, on the Lampeter campus, the community and the university are very much coexistent with one another, and both thrive from interacting together. Therefore, one of my objectives this year, as president, was to try to build an even stronger bond between the university and the local community by bringing people from the town on to our campus and also by encouraging students to venture out by volunteering and socialising in town. On March 22nd we invited 16 clients and four staff members who live and work in the local care home Hafan Deg to come to Lampeter for a Vintage themed afternoon tea party with live entertainment, lots and lots of cups of tea and a wonderful buffet. Leading up to the event volunteers from all corners of social groups on campus chipped in together to help raise money to be able to provide food and decoration for the event. The Student Volunteer Team donated baked goods and raised almost £60! We even went on a tour around campus, like an SU meals on wheels (probably more like daps and scraps), knocking on the Dean’s door trying to fatten him up and getting him to part with his money for the great cause (he did)! After all our fundraising and planning, the day was finally here!! The afternoon went incredibly well, our guests were fed and watered by our fabulous student volunteers (we even had a volunteer come over from the Swansea valley to help out), with lemon cakes, cucumber sandwiches, sausage rolls and Welsh cakes as far as the eye could see! We played songs with lyrics on the projector screen and all sang lovely old songs from the White Cliffs of Dover to Calon Lân to transport our guest back in time when music wasn’t just ‘boom, boom, boom’ (as my nan would say). Then finally, to wrap the afternoon up, we ended with a two piece student band (Cameron Dunmore and Matt Baker) singing some beautiful songs to the accompaniment of their guitars and ukuleles. Although the day was truly lovely, what made it even more exceptional was talking to the clients and getting to know them, as people. I even met Lampeter’s very own campus nurse who used to work here many years ago, who was exceptionally delighted to be invited back to the University to spend time with students once more – a demographic in which she used to regard as family. We forget how little gestures like an invite to this event can really mean so much to the people around. Also how students and our elderly visitors engaging in conversation, sharing laughter and song really did show how vital it is for us, as students, not to miss out on these special opportunities to connect and learn with others around us. I’d like to finish off by saying a big, huge, massive, mammoth, solid thank you to everyone who volunteered and came along to the event (you made me cry, twice). The clients would love to come back again for another party as they absolutely loved the afternoon, and that was all down to our fabulous student volunteers – you should be exceptionally proud! To find out more about the students’ union, visit the website www.tsdsu.co.uk.